FILM IS ON THE MENU this November 3 and 4. Fogo Island Inn welcomes the creators of Devour! Food & Film Fest to a weekend made for cinephiles and epicures. Devour!’s Chef Howell and the Fogo Island Inn Kitchen Collective will pair a menu of ingredients harvested from the bounty of Fogo Island’s land and sea, with works of superb artistry and taste made for the screen. It is a weekend for the senses: from the Friday evening film reception to Saturday’s epic supper, and a Sunday morning farewell forage breakfast. Whet your appetite for the weekend ahead, and join us in the lounge for a Friday evening reception with bites prepared by Devour!’s Chef Howell, and the Fogo Island Inn Kitchen Collective. Later, supper will showcase the best of the Island, with a special chowder cook-off, featuring two chowders made with regional ingredients. On Saturday, begin your day with a leisurely breakfast, then meet your Community Host: a life-long Islander who is sure to share stories of Fogo Island’s cinematic legacy- Fogo Process- and, if you’re lucky, reveal the best ways to make cod cakes, toutons and brewis. The evening’s programming, a curated food-film pairing, will offer up six short films selected by Managing Director Lia Rinaldo, screened during a six-course meal. Wake up on Sunday to discover your Daybreak Box filled with pre-breakfast treats. Make your way to the Dining Room for brunch, and a farewell film reel. The two-night-minimum itinerary for the Devour! Food & Film Weekend at Fogo Island Inn includes all meals, welcome cocktails, film and food pairings, and a half-day Community Host orientation. 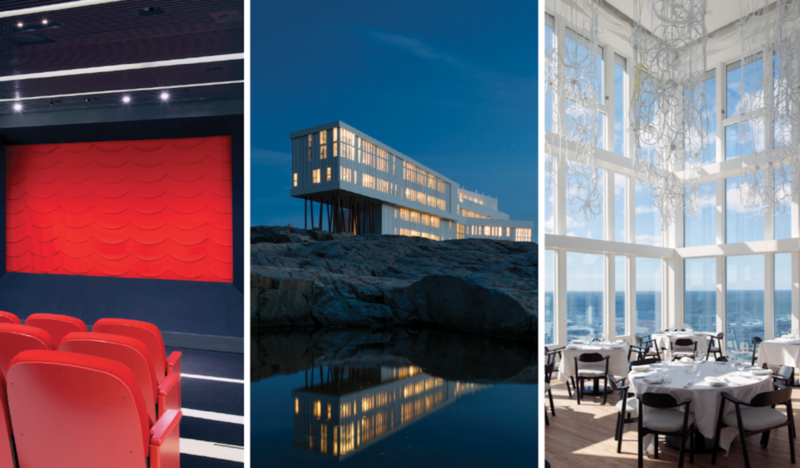 Check in to your remote and luxurious home-away-from-home, Fogo Island Inn; a traditional yet contemporary masterpiece of modern architecture and design. Convene to the Lounge for a pre-supper reception with Chef Michael Howell, and Fogo Island Inn’s Kitchen Collective. Judge for yourself during a suppertime chowder cook-off featuring the best of Fogo Island and its regional cuisine, then head to the Cinema for a late evening culinary screening. Join your Community Host on an exhilarating and informative Island Orientation. Be prepared for fresh perspectives and insights, stories and laughter during your half-day outing. In the afternoon you may wish to set out on a hike, walk or ramble. Climb Brimstone Head, wend your way around Lion’s Den Trail, or trace your way along Turpin’s Trail. Should you prefer to spend your afternoon relaxing at the Inn, unwind in our sauna or gym, enjoy a hot beverage and a good book in our library or opt for personal time in your suite. Come evening, you will feast on a six-course collaborative meal in our Dining Room, brought to you by Chef Howell and our Kitchen Collective. Devour!’s film curation from Devour! Managing Director Lia Rinaldo is the guiding theme for this exceptional meal, with six short films inspiring each of your courses. Greet the sun as she rises from the ocean and find a handmade wooden daybreak box outside your door filled with coffee, tea and fresh pastries. Linger. Join us in the Dining Room for a special farewell breakfast, and film reel, brought to you by Devour!